Long gone are the days of printing out photos and accruing them on your physical photo albums. Well, although they still do exist even to-date, but the digital age has changed the face of Photography. For all the digital space that your photos now take up, we have witnessed an influx of Photo sharing sites where you could simply host and put on display your amazing vacation time. While there are many online products offering image hosting services, a lot has to be taken into consideration when you opt for one out of them. Some of them being the storage space provided, the album display interface, editing and copyright options, overall ease of use and much more. While Flickr is one of the best Photo sharing services on the web, there are definitely alternatives to it that one ought to consider. Why the need for Flickr Alternatives? While being said that Flickr is a pretty decent Photo sharing service on the web, it isn’t definitely on the top of the pile here. Flickr has been largely criticized by millions of users after its infamous sell-out to Yahoo! Although Yahoo! did add some features and provided lots of space to ponder upon, that didn’t do too well to convince its loyal user base. Flickr has a pretty bad interface for a photo sharing website, not something the way professional photographers or designers would want to showcase their works. Flickr also lacks in the kind of community spirit among its users, since their acquisition. Just like a Startup gobbled up by a major company, Flickr began more work on Integration, than on Innovating its own product. Finally, Flickr’s absence from Top 30 Mobile Photography apps on iTunes stands testimony to their lack of a proper Mobile application. That pretty much summed up the state of Flickr’s being and there’s definitely more to cheer about than this photo sharing app. Here are the best Flickr Alternatives that one must definitely consider as a viable option. 500px is easily one of the best Flickr alternative which serves as an effective community for digital photography enthusiasts. This Toronto-based startup offers the best photo sharing service on the web, that facilitates users to upload photos from their local devices, or through Dropbox, Flickr, Facebook and more integrations. 500px allows users on its free plan to upload only 20 images per week, but the upside is their premium plans starting at $25 annually still beats the steep $50 plans on Flickr. A better Albums layout, better commenting and user voting structure easily make 500px one of the best choices for photographers. Even its free plans allows users to upload and earn from their photos in royalties when used somewhere. 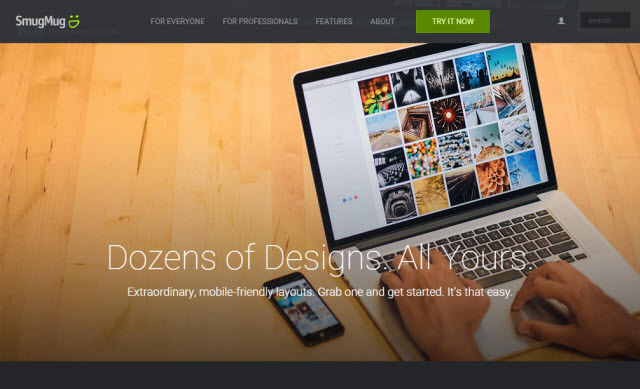 The website also allows users to browse images uploaded by other 500px members. Integration of Google Analytics on their premium plans and the free Android and iOS applications place 500px as the best competitor of Flickr on the web. Key Features: Better user interface, Commenting and User voting system, Affordable premium plans, Mobile applications, Better community for artists. Plans and Pricing: Free; $2.08/month; $6.25/month; $13.75/month. 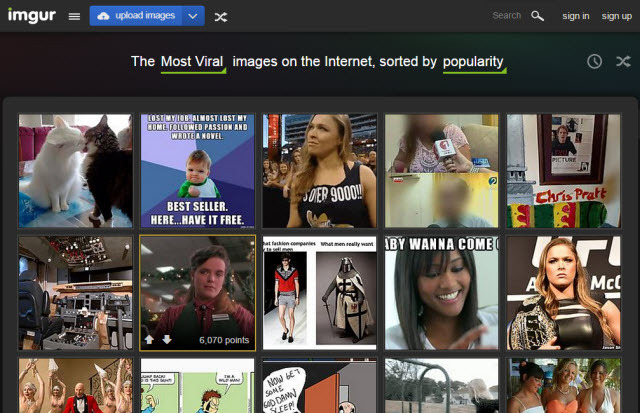 Imgur is another one of the most popular photo sharing websites on the web. Mostly home to some of the best cat pictures and memes, thanks to its Meme creator. Recently made a completely free service that allows unlimited photo uploading, Imgur has a lot of popularity for a photo sharing service. . The home page itself presents images from around the web and you can browse them all without even signing up. An Upvote/Downvote and ‘Favourite‘ feature allow the Imgur community to rank the uploaded images accordingly. Imgur allows users to either upload images from local drive, through image URL or by dragging and dropping them to Imgur. Once uploaded, you can either choose to make the photos public or choose to create your own private album on the network. The ease of sharing Imgur images on Social media makes this network one of the most popular photo sharing services. This service also doubles up as a social network, allowing you to connect with them and to send them private messages. Key Features: Better User commenting, Up-voting and Favourites system; Unlimited free image uploads, Meme creation, Android and iOS applications. DeviantArt is often mistaken as a network only for the digital artists, but in fact it is home to many professional photographers and artists. DeviantArt features a more younger and vibrant community, which is a great place for your photos. The free membership of DeviantArt allows users to store 2 GB of images on the network. While most of the users on DeviantArt network make use of it primarily as an art-portfolio, it does more than that. The DeviantArt Critique tool is a great way to get meaningful recommendations and feedback from the community. 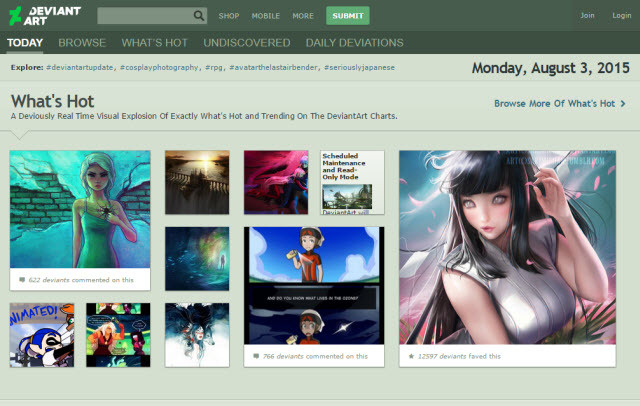 Images can be favourite’d on DeviantArt and you can browse through the entire network, without even registering. You can also connect and interact with professional artists to gain further insights on the project you are working on. A must-visit place for every digital photography and art admirer. Key Features: Groups, Chats, User Critiques, Portfolio, 2 GB Free storage, professional artists’ community, Android and iOS applications and more. With over 300 Million active users, this Facebook owned mobile application is one of the best photo sharing services on the web. Although Instagram does feature a web-version, it doesn’t do much than displaying images from those you follow and for a quick profile edit. 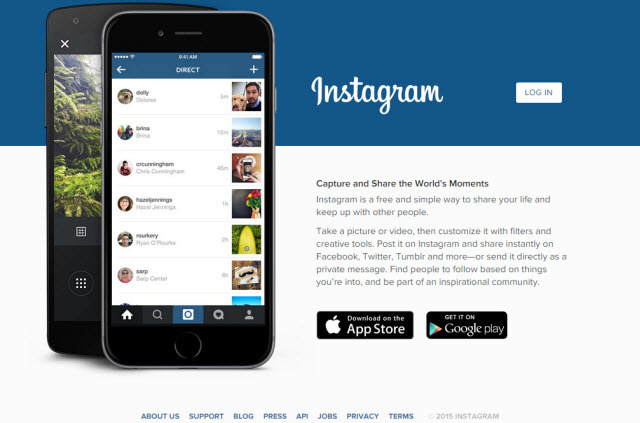 The mobile application of Instagram is by far the best Photo sharing app on the Internet. Instagram doesn’t place any limit on the number of photos you can upload to the network. Instagram also allows users to upload short videos of 15 seconds, in addition to the photo sharing. Ease of connecting to Facebook, Tumblr and Twitter makes it easier to repost your images on other social networks. Instagram Direct allows users to send private images directly to some other user. Instagram is famous for its filters and the explore tab, that lets you search by Hashtags. You can use Instagram application to take photos directly from your mobile camera or choose to upload one from your local device or other social media profiles. Key Features: Powerful mobile application, User profiles, Instagram Direct, Short-videos, Filters and Hashtags, Unlimited uploads and more. If you are looking for a completely premium photo sharing service on the web, SmugMug would be your best bet. This is an all-paid photo sharing service that caters to the needs of the professional photographers and artists. SmugMug offers unlimited storage space and uploads to all of their premium users. Some key additional features like an online digital store-front for your images, themes for your store-front, custom domain names, right-click protection and much more on their other high-end services. With Plans starting from $5/month, you can upgrade all the way to $35/month. For professional photographers who are serious in their pursuit of selling their best works online, SmugMug would easily be the best choice. Even allowing Video and GIF uploading, SmugMug features a host of facilities that are otherwise not accessible on other photo sharing services. Key Features: Unlimited storage space and uploads, Right-click image protection, Video uploads, Digital store-front, custom domain name, Portfolio view, mobile applications and more. Plans and Pricing: $5/month, $8/month, $25/month, $35/month. 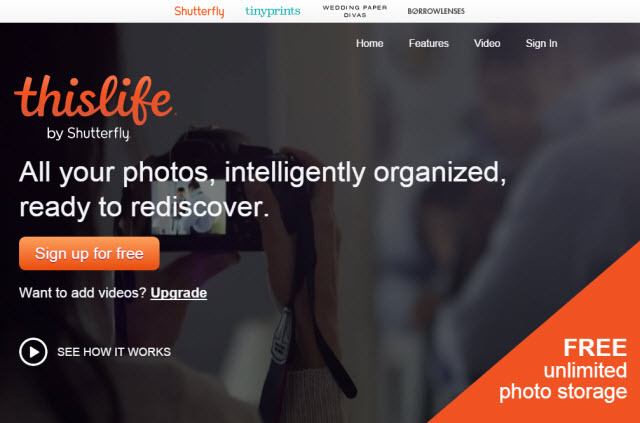 Acquired by Shutterfly two years back, ThisLife is a great online photo sharing and organizing tool. ThisLife perfectly curates all of your images from their different sources like your local devices and social networks together into a single place. You can use this tool to manage all of your images and uploads right from a single dashboard. ThisLife offers unlimited photo uploads for all of its users and it only required paid subscription, should you decide to upload videos. Some of the key features of ThisLife include Facial recognition, Auto-importing of tags, Better organized timeline view, Auto-uploading, slideshows and much more. ThisLife is a feature-rich free online photo aggregation and sharing service which serves its purpose as one of the best on the web. Key Features: Facial recognition, Auto-tagging and Auto-uploading, Advanced search, Unlimited uploads, Import from local device/social networks, Slideshows and more. Plans and Pricing: $19.99/year, $49.99/year, $139.99/year (Premium plans Only for Video uploads). With over 10 Billion hosted images on the network, Photobucket is by far one of the biggest online photo sharing services. Photobucket allows its users to upload images and videos to their network through uploading from local device, through Facebook or through URLs. 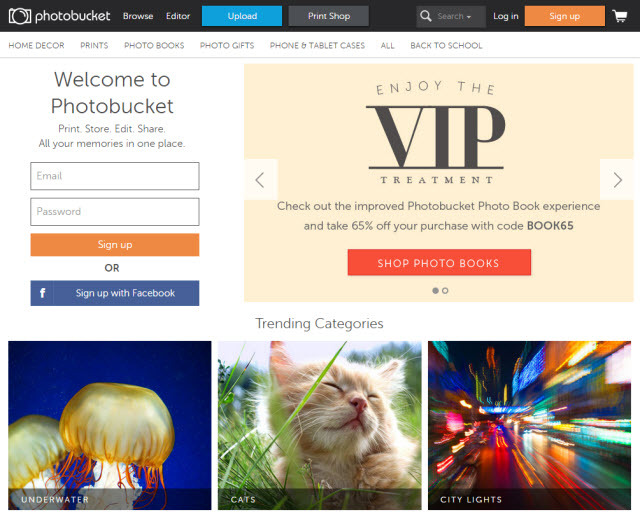 The free plan on Photobucket offers 2 GB of free space to the users and you can upgrade to a premium plan for additional storage space. All major file formats are supported by Photobucket and the advanced privacy options on Photobucket is one of the best on the web. There are three key privacy options for your uploads on Photobucket: Public, Private and Password-protected. The network also allows you to browse images from some of the top categories. Users can also directly print images on Photobucket. Key Features: Print images, Advanced privacy options, Browse images from top categories and more. Plans and Pricing: $2.99/$4.99/$8.99/$16.99/$39.99 /Month. 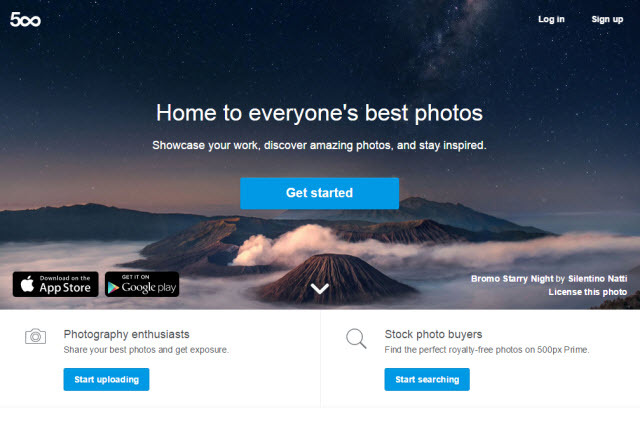 The search engine giant’s revamped version of the Photos feature of Google+ gave rise to Google Photos. 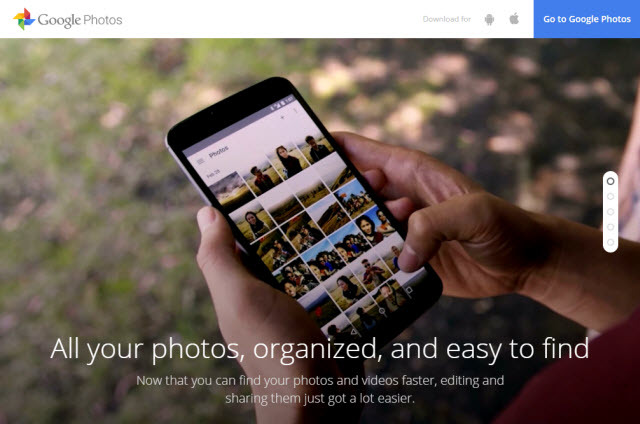 Google Photos is now a standalone photo sharing service on the web. This network offers unlimited uploading of photos and videos. Google Photos easily aggregates all of your photos and videos from different devices and social media profiles for you. Google Photos does the task of organizing all of your media into beautiful galleries and GIFs is wonderful. Google Photos also does features some great photo editing tools to make your images stand out. While it does offer unlimited uploads, Google Photos compresses your images if they exceed the 16 MP mark. That would be a bit disappointment for professional photographers looking to upload high-res images to this network. Paired with Android and iOS apps, Google Photos is all-in-all a great photo sharing app for hosting your images online. However if you don’t want to compromise on the resolution of images and want to increase the storage then you can choose to go with paid plans which starts from $1.99/month for 100 GB and so on. Key Features: Unlimited uploads of Photos and videos, Photo editing tools, Beautiful online image aggregator/organizer and more. Plans and Pricing: Free, option to use paid plans starting from $1.99/month for 100 GB. While this may come in as a surprise to many readers, Facebook does offer one of the best photo sharing services on the web. With over 350 Million images being uploaded to the network everyday, this is a sure-fire sign of the ability of the network as an image sharing service. 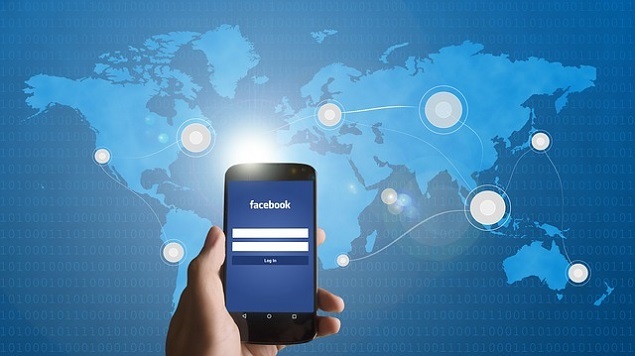 Facebook allows users to upload unlimited number of photos and videos to their network. Facebook’s advanced privacy options allow users to make the images private, public or share them with a select few. Facebook also allows you to create as many albums as you wish to and you can also geo-tag the location and your friends within it. Facebook for storing your images is one great way to manage your photos without leaving from the network that is widely popular. The entire social community of Facebook closely knitted around your images makes Facebook one of the best Flickr Alternatives. Key Features: Unlimited photo and video uploads, The Facebook community, geo-tagging and friends-tagging, Advanced privacy options and more. 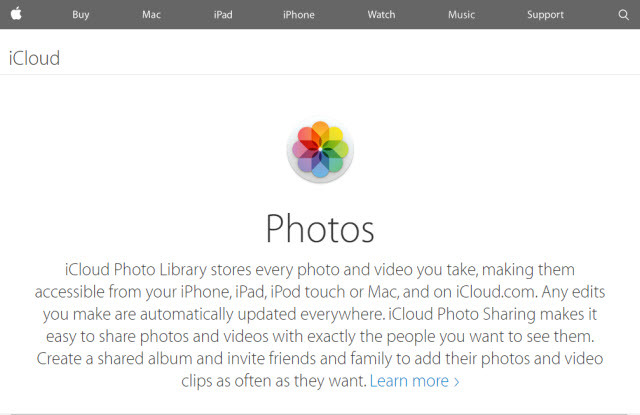 Apple iCloud Photo Library is a subsection of Apple’s iCloud service. With the added advantage of Apple’s seamless integration across all devices, iCloud Photo library makes it easier for users to better organize their photos. Using this service, every photo or video that you take gets synced across all of your Apple devices. iCloud Library also allows creation of a shared library to involve friends and family in your photo streams. Organized into Moments, Collections and Years, iCloud Photo Library offers a drag-and-drop management of your photos. The free version of iCloud Photo Library comes with a storage space of 5 GB and additional storage would require premium plan subscription. Setting up iCloud Photo Library on any of your device is pretty straightforward and with this you’ll have all of your media perfectly synced across your devices. Key Features: Seamless syncing of your media across all devices, Free 5 GB storage space, Organize photos into different categories, drag-and-drop management of images and more. Plans and Pricing: $0.99/$3.99/$9.99/$13.99 per Month for Additional 20/200/500 GB and 1 TB of storage space respectively. Now that we have come to the end of this list of best Flickr Alternatives, which of these networks happen to be your favorite online photo sharing service? Share your thoughts and comments below.